I always wear a wristwatch. But I notice that wristwatches are far less common today now that cell phones are everywhere. Wired ran an article reviewing four atomic watches. The “atomic” part of the name means that the watches set their time using the atomic clock at the WWVB time station in Colorado. Some of them can also use time stations in England, Germany, Japan, and China. The watches are filled with unusual features, but with prices to match. I notice that they don’t mention a stopwatch, countdown timer, or alarms, even though the Pathfinder does have all three. 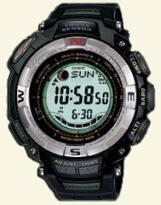 The Casio Pathfinder is a pretty impressive watch and it really should be, when you consider the retail price of $350.